This Guy GS Special was attending a West Bromwich running day at the Black Country Museum in September 2014. It was new to London Transport in December 1953 as fleet number GS40 and has an Eastern Coachworks B26F body (number 6386). MXX 340 looks superb and was accompanied by three other West Bromwich buses. This is surely one of the smartest liveries in the country. Heartily agree that West Bromwich Corporation had one of the smartest fleet liveries in the country, along with City of Oxford. Rightly or wrongly I was always under the impression that this vehicle was primarily for use of the Social Services Department although it was numbered 252 in the main fleet series, as was a second ex-London GS (251) whose identity escapes me at the moment. The other one, Larry B, was MXX 341, which was 233 in the West Bromwich fleet. It was scrapped in 1972. I think this is resident at the Black Country Museum. It was certainly in service doing the "round the site" service when I was there last year. Looks good in this livery, but seemed mechanically a bit run down, though OK for what it was doing. David, They had problems with this one on the day that I took the pic. It would not start and remained at rest whilst the other three did the round the site trips.It was good to see, would have been better to ride! 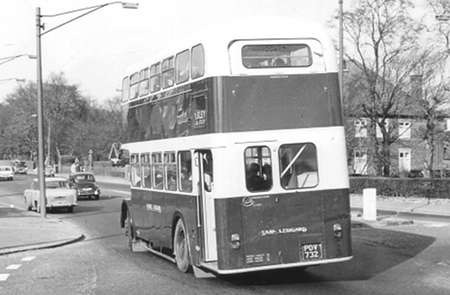 To return to West Bromwich, near contemporaries of the GEA registered Daimler double deckers, a pair of which were posted on site a week or so ago, were a batch of single deckers. The chassis were built in 1948, but due to pressure of work at Metro-Cammell the bodies were not ready until 1952. By then, of course, under floor engined saloons were almost ubiquitous, so they seemed old even when new. One of them, FEA 156, has been preserved and is seen here in 2012, in West Brom’s superb livery. Thanks for posting, Tony. I agree with your comment about their ‘old’ appearance, even from new. If the entry at the rear had been fitted with a door, or if the door had been just behind the front wheels (as with Birmingham’s Tigers, for example) it might have helped. Looks a bit old, even for 1948…. it is not helped by the slopey windscreen and rear entrance. I have never seen a Daimler radiator finished in what looks like silver paint.. is this authentic? It makes the radiator seem to project even more in front of the bodywork, which cannot be the engine length as it is a G5: contemporary Daimlers weren’t always so, I suggest. Nice looking preservation, though. Interesting bonnet opening arrangement as well, I don’t think I’ve ever seen that before. Was this normal Daimler practice at the time? Wonderful livery! One of the all time classics. It seems strange that it took four years to build bodies for this small batch of vehicles despite the post-war high demand for new vehicles. I was also thinking that the four year delay was excessive and must have had some other factor. One other thing I’m not sure of is the length of this bus. I am inclined to think that it’s a thirty-foot long vehicle as 38 is a lot of seats to fit into one twenty-seven and a half feet long when you take into account the platform style which didn’t sit well with maximising seating capacity. The thing is, I’m sure the increased length didn’t become legal until at least 1949, so why build an illegal chassis in 1948? 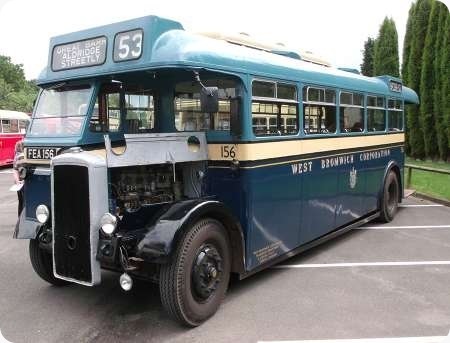 Having looked around the web a bit and been rather distracted by some shots of this bus’s superbly-restored double-deck sister 174 I find references to the chassis being built in 1950. Everything then makes sense. So what is the correct year for the chassis – I have no primary sources to refer to? Edinburgh bought several batches of saloons with this kind of MCW body including Guys and some similar Daimlers. The body was basically a pre war design. Yes, FEA 156 is 30′ long. The chassis was lengthened when the body was fitted, as this was legal by then. With regards to the radiator finish, the bus was restored as original as can be, as part of the 156 group we have photos in colour that show 156 had a painted radiator compared to the more ‘standard’ finish that was used with Daimler, I believe they were painted depending on the engine, but when I have found out the correct reason why I will let you all know. It’s lovely to see one of these W. Bromwich buses looking impeccable. In my RAF service days in the late 1950’s we’d go into Brum from time to time and see a W. Bromwich bus whizzing across a junction or lurking in a side road. I honestly never saw one other than faded and tatty. It didn’t help that B’ham Corp’n vehicles were always impeccable, greatly helped by a policy of no adverts. Seen here together are 156 and the recently restored 174 at an event at AMRTM, Aldridge. They make a fine pair, tony. Thx for posting. Re: FEA 156. What a stunning body style this was. I probably saw all these when I worked in West Brom and I always considered them to be unique especially with the rear cut-away entrance and no door. The driver also appeared to sit up very high. Re: GEA 174. Yet another stunning body style. The flared skirt just makes for a truly handsome vehicle. I rode these as often as I could on the 74 & 75 routes in preference to the Birmingham buses. They had the front row of seats in the lower deck turned at right angles to face each other. Pity the Beclawat top hinged window vents to the front upper deck are missing. Most likely unable to find any replacements. Actually pictured during their final West Midlands P.T.E. days – though there is little here to suggest it – this fine pair of former West Bromwich Corporation Daimler CVG6’s with traditionally shaped Weymann H30/26R bodywork was caught taking an off-peak rest at the town’s depot on 10th August, 1971. What a superb livery it was, and just imagine how superior a modern Gemini double decker would look in the same style, compared to the more usual stripes, swoops and general garishness. For vehicles nineteen years old these two impeccable and seemingly unblemished beauties in a classic livery are a real tribute to the manufacturer and to both operators. I agree entirely John with your triple condemnations of the modern Gemini appearance, and that of other brands too, and would add a fourth – seemingly appalling standards of construction. I would far rather take a long journey in one of the Daimlers than in any of the current offerings which routinely display more rattles and body movement after nineteen days than the old troopers would do after the same number of years – and I say that with not a trace of "rose tinted glasses." Another GEA registered Daimler is seen on its way to Aberystwyth, well outside its comfort zone! It was hired by the West Midlands Transport Circle, Easter Monday 1973. 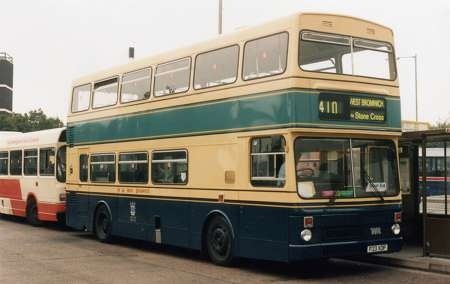 Not quite a Gemini, but this is what a Metrobus looked like in West Brom’s livery. The body design looks right, the livery looks right. The combination looks right. Thank you, John, for posting. Although the majority of modern "liveries" look like something concocted by Dali after a night on the absinthe the recent repainting of a Wright bodied Volvo of First South Yorkshire into Sheffield livery shows that the bus can look good if the right colours are applied in the right proportions. West Bromwich had a wonderful livery, the bottom not being ulike B’ham Corp’n, but the lighter blue at the top contrasted beautifully. 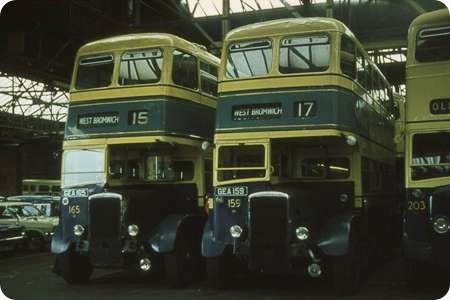 Sad to say, at the time I was sculling around B’ham, in the mid-50’s, my glimpses of them showed too may of their buses looked rather sad in faded liveries. Well said, Mr Hough! It isn’t just the livery and the standard of production of the modern bus that is a problem. I was on one of WORST’s buses in Gosport recently. A lady in a wheelchair boarded, with assistance, but it was very difficult to move into the (nearside) marked space because of a grab rail. Had the designated wheelchair space been offside, there would have been little difficulty. The grab rail has to be where it is, apparently, because it helps to hold the roof up! I’m glad you posted the Heritage-painted Metrobus, Tony, because I recalled it after my earlier post and how smart the livery looked on a modern ‘box’. I think that several WM buses went back into their original constituent liveries at this time – mid 1990’s? Putting on my tin hat am I not correct in saying that some of the "stripes, swoops and general garishness" are designed by Ray Stenning, the Editor of Classic Bus. magazine. Thank you Pete and Chris H x 2 – its reassuring to see that, despite the modern regrettable trend, conservative appreciation of real quality and dignity in appearance is still alive and well !! A fine livery indeed, and I’m surprised that they managed to survived into the Wumpty era. However, I’m puzzled by the reference to them having a traditional-shaped Weymann body. For me, the traditional flared-skirted Weymanns seemed to have slightly drooping eyelids (to use a technical term) caused by the louvers over the upper deck front windows. These admittedly fine looking buses lack this feature and seem to be a precursor of the Orion style of upper front windows – or have I had one too many glasses of Rioja? When I referred to these bodies being ‘traditionally shaped’ I did not mean to suggest that they possessed exactly the features of the earlier Weymann design to which Paul refers, but just that in a general sense they were traditionally well proportioned, shapely and tasteful, as opposed to boxlike, slab-sided and ugly – as so many bodies of the period were becoming. If anything, the shape of the front domes remind me more of the Metro-Cammell ‘Phoenix’ design as supplied to Manchester and Salford. But then just to show how fickle and contrary my opinions can be, I realise I also have a certain peculiar liking for some of the boxlike, slab-sided and ugly buses too – certain Orions (in the right livery) for example, even Bridgemasters, and I really liked the Park Royal-bodied Renown. So I suppose I’ve now blown any credibility I had with Chris Y! (but remember Ledgard’s ex-Devon General Regents Chris – you know you liked them). Please fear not John – your 100% credibility remains untainted at that commendably high rating !! I did indeed admire the two Devon General Regents, PDV 726/732, although sadly I never worked on them as they were always based at Armley headquarters. It would have been nice to encounter one which was just possible in only two circumstances. On Mondays to Fridays Otley depot operated one return journey with an Armley vehicle – the 4.25pm Ilkley – Guiseley – Leeds and 5.27pm Leeds – Guiseley – Ilkley. The crafty purpose of this little exercise was to facilitate the running into the correct depot of each vehicle on the route late at night. One other remote possibility occurred on Saturdays, when an Otley depot crew took an Armley Depot Leeds – Otley – Ilkley bus from Otley to Ilkley and back while the Leeds crew had a forty minute meal break. All clever stuff, but I never encountered a "Devonian" while working these trips, but here is picture of one at West Park, Leeds from an unusual angle. Yes, Paragon, most do come from Ray Stenning. Have you ever encountered him? Chris Hough. Have just returned from a weekend with family and friends in Sheffield. Both the tram and the bus liveried Wrights buses look superb – but this was also my first experience of the new Worst Bus livery. It’s atrocious – looks like it’s been painted in primer and then left there! 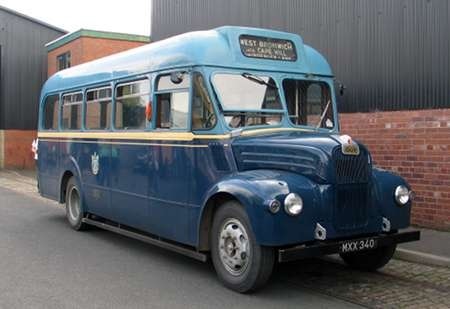 The West Bromwich Daimlers are a modified form of the original Aurora – cf Sheffield and Rotherham on this forum, not to mention the famous Rochdale Regent Vs. The Aurora kept the structure and shape of the classic Weymann but with different detailing – including aluminium window pans. John, you are almost certainly correct in saying that the domes comes from the Met-Camm Phoenix. I think that these were the only Weymanns delivered to West Brom, all others ostensibly Met-Camm. (I think it was a capacity problem that led to Addlestone getting the contract but, as a result, there were several Met-Camm details.) I’m with you on the Orion, John. Sheffield, St Helens and DG had liveries which could lift the Orion from the mundane. Seems Ledgard also knew how to apply the paint as well. PS: I think some late Orions for West Bromwich were sub-contracted out because of capacity problems at Met-Camm. I believe Strachans did the work and also built some Metropolitan coaches (on sub-contract) on Ford R192 chassis. A little later, the same happened again when Saunders-Roe (still existing, but dormant in bus building at the time) built, or finished, some Met-Camm Atlanteans for Devon General (G reg.). This came about because Saunders-Roe, by then, were owned by Cammell-Laird. It was suggested in the recent second part of the Weymann story (Senior/Venture) that this was because of serious mis-calculation at Birmingham who thought that closing Weymann’s in 1966 would remove overcapacity only then to find that they were struggling to cope with orders a year or two later. Been away all weekend and just seen this thread. Weren’t the West Brom bodies 7 ft 6 in versions of the Phoenix? As to the First Bus scheme, it generally looks dreadful but, for the first time I saw their ADL Enviro 400s in Manchester and it seems to work in fact I’d say it suits them. Pete. Never met Ray Stenning but I have seen his photograph on Google. I just find it ironical. Good magazine though and improved under his editorship. I had several dealings with Ray Stenning of "Best Impressions" in my time at LCBS. He regularly turned up, appropriately bearded and garbed, on his Harley Davidson motorcycle. In the final years of NBC, when I was briefly TM at LCBS South East, I devised a new name for the new company – Kentish Bus – and a new livery of maroon and cream. My MD, with whom I had a less than cordial relationship, insisted that Ray Stenning be brought in on the act, and he added additional narrow stripes midway along the panelling, which, though attractive, added to the coach painting costs. This livery won a prize from the Commercial Motor magazine, an event that my MD graciously attended and accepted. I discovered all this later when I read about it in the magazine. Such was life at the end of NBC – anything went in the tawdry scramble for a foothold in the forthcoming privatised "future" of the bus industry. Interestingly, after I had left, when Kentish Bus was sold off to Proudmutual (aka Northumbria, part of United Auto) who installed their own management, the livery reverted to my original scheme. Plus ça change, plus c’est la même chose. Ray Stenning later took over the editorship of Classic Bus magazine from Gavin Booth (after a short period with another editor) and immediately changed the appearance from black print on white paper to one of coloured type against a half tone photographic background. After subscribing to the magazine for several years, I found the new format unreadable without acquiring a headache, and cancelled. All around us now, and not just in the bus industry, we see practicality subordinated to "design". As Shakespeare said centuries ago, what we need is "More matter with less art". At least if theres a war the First buses are already in camouflage! try spotting one after dark. Prior to Yorkshire Rider being sold to Badgerline each district had a bus in traditional livery with the strapline proud of our heritage this included erstwhile West Yorkshire and York city service vehicles. Marketing people always see things in terms of penetration of brand however in an industry where there is often no direct competition why not acknowledge the local nature of the service and make the local population feel its their service and they are not seen as a necessary evil who reacts in a way that only humans can awkwardly oddly and just plain humanly! Roger, l lived in East Sussex at the time and commuted regularly to Croydon as well as Central London. The Kentish Bus livery was clean, modern, attractive and sat well on both Routemaster and Atlantean bodies and came as a welcome innovation in the land of red and green, especially the NBC green. Congratulations on your colour sense and the layout. 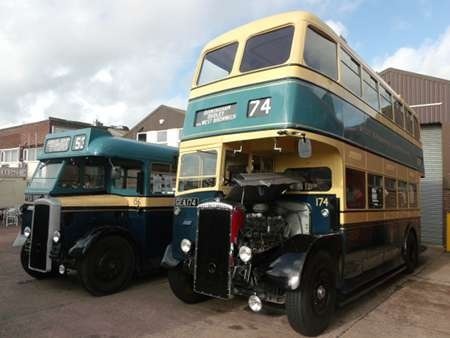 David – As well as the Devon General Atlanteans, weren’t some Brighton PD3s also bodied/ finished by Cammell Laird? I have attached my photo of a Ford R192 bodied by Strachan. Until quite recently, I thought it was a genuine Metro Cammell, but now know better! 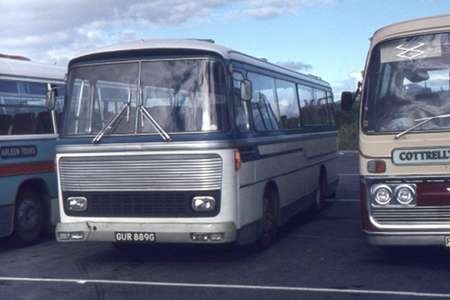 GUR889G was seen at Weston super Mare in July 1974, when it was operated by Crown Tours, Frome. Thanks for that, and the splendid picture. Pity it has such a big mouth. What would more attention to detail have done to the overall look? Roger – I can say in a very brief few words how I entirely admire and agree with your comments above. I am totally sick to the back teeth of how the "marketing" fraternity have inflicted their zany "supermarket" branding disease on the bus industry and have turned all the nicely designed horizontally travelling vehicles into mobile graffiti studios. A minority of honourable and proud operators have courageously bucked the trend and retained some dignity – just to cite a couple of examples, the glorious DELAINE of Bourne and PENNINE of Skipton. I’d better put up the shutters now, before a missile emblazoned with "Best Impressions" heads this way !! An impression is when you press hard and leave your mark. Well Mr Best has certainly done that. Can’t come up with a pithy one like "Worst Bus" – unless you will accept "Deep Depressions"? "Deep depressions" accepted unconditionally David – that’s pithy enough for me !! West Brom – probably the most agreeable bus livery of all time, with City of Brum a close second! We have an Annual ‘Local Heritage Week’ at the Christian Heritge Centre in Rowley, near Blackheath (West Midlands). We try to have a lot of old photos and books on a certain subject, this year, the focus being on ‘Transport’. 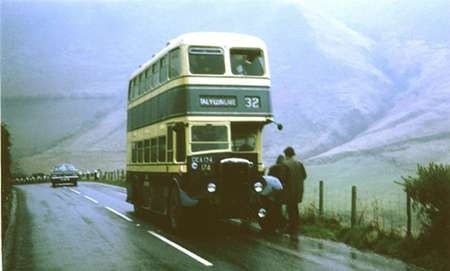 We are looking for any pictures of public transport – in your case, buses, that would be local to the area over the past 50-70 years. I notice one or two pictures of West Bromwich buses on your site, and wondered if you could give me details of who to contact re: copyright….or if someone on your site could help us in any way…….